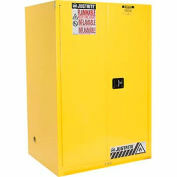 Justrite® Slimline flammable safety cabinet offers expanded storage when used next to Justrites standard flammable cabinets and allow separation of incompatible liquids. 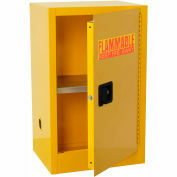 The narrow fit design of these Slim flammable storage cabinet is ideal for tight spaces. Double walled 18-gauge all-welded steel with 1-1/2" insulating air space helps keep temperatures down. 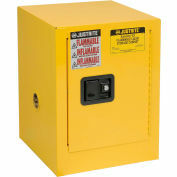 The dual 2" vents of this flammable cabinet can connect to an exhaust system. Safety cabinet has a 2D leak proof doorsill to contain spills. 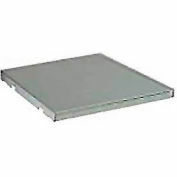 The 350 lb galvanized steel shelves of this flammable liquid cabinet adjusts at 3" increments and feature a SpillSlope design that directs spills to back and bottom of safety cabinet. Doors have full length piano hinges. 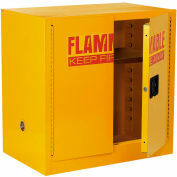 Justrite® Flammable Cabinet has a recessed paddle handle with cylinder lock and padlockable latch for security. Stainless steel 3-point self-latching system provides positive door locking. 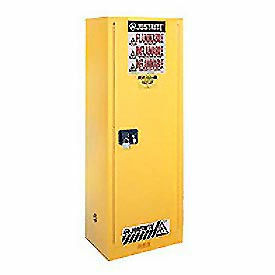 This safety storage cabinet includes a built in grounding connector. 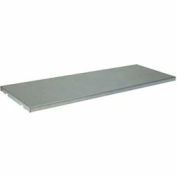 Includes adjustable leveling feet for uneven floors. Durable powder coat finish with Haz-Alert trilingual reflective warning label provides high visibility. 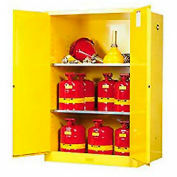 Complies with the National Fire Protection Association Flammable Combustible Liquid Code #30 and OSHA standard 1910.106 for flammable storage of 1, 2 and 3 liquids. FM approved. 10 Year Limited Warranty. Manual-Close Single Doors will not close automatically. Meets the approval of the National Fire Protection Association flammable liquid code #30.